Or should I say, the Janet Foy and Chris Hickey Clinic. Unbeknownst to us, Debbie experienced severe vertigo before getting on the plane and was banned from flying, so Chris Hickey (formerly of Hilltop Farm – a la Riverman, Don Principe etc) filled in for her. Certainly it was a dissapointment that Debbie could not be there, but that didn’t mean the day wasn’t exceptionally informational nonetheless. 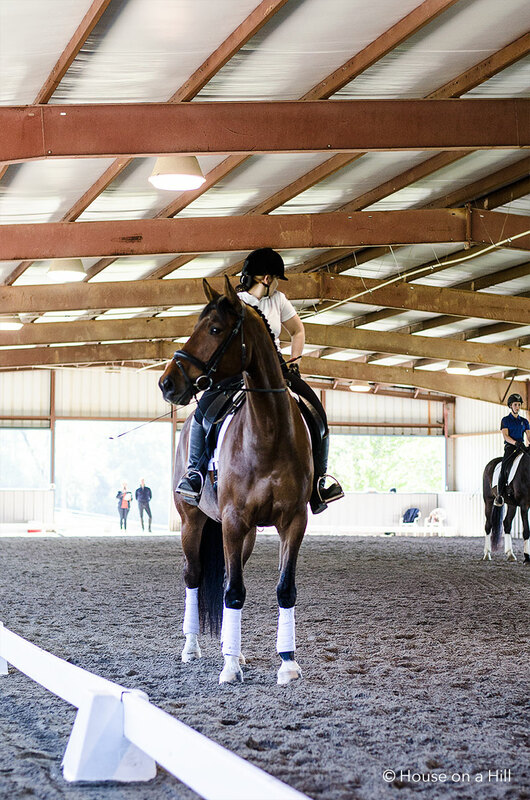 The clinic was structured around each level, progressing from Training level to Grand Prix with two riders demoing part of their level’s test or movements. 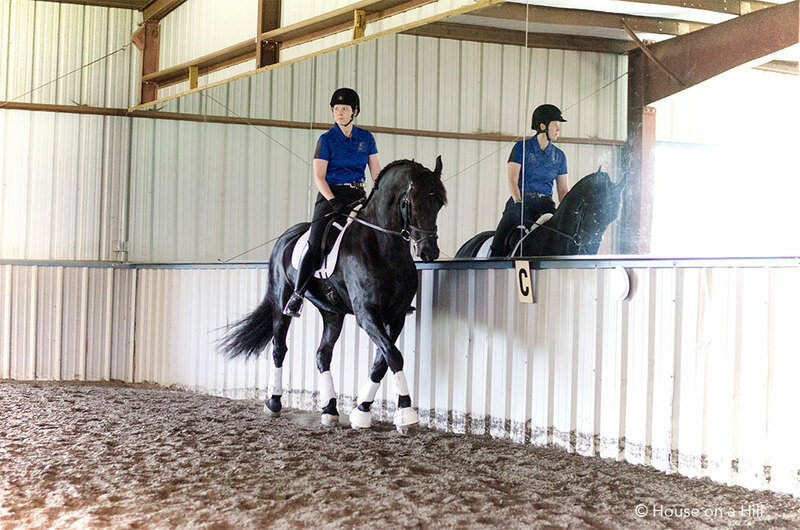 Janet spoke mostly from a judge’s point of view, providing scores and their justification as the riders went through the test elements, followed by Chris working on each pair’s weaknesses for a short time. Because the clinic was so darn long (8:30am – 4pm) there was just too much to capture in one post. So today, let’s look at the more general feedback and Training and First level demos. 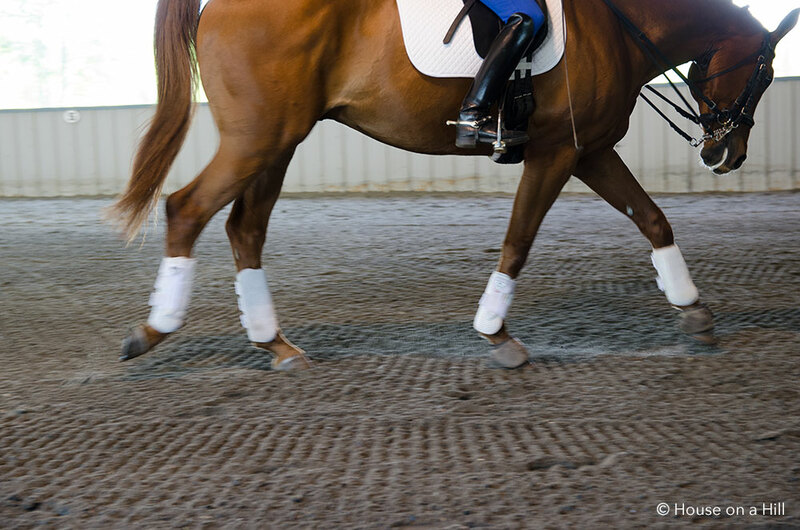 Janet describes a “red line” for her, where at scores of 5 and 6 there are more problems than good, and where that starts to affect the overall scores of submission, gaits, etc. Tomorrow, Second thru Fourth level and my overall impressions from the day! That’s a bummer about Debbie, but still sounds awesome! I love the general notes. I like when forward is stressed when I see so many horses at my barn being ridden front to back. Ugh. It’s definitely tempting to ride front-to-back since visually that’s what we see as a rider. Something I try very hard not to do, and seeing Janet and Chris really emphasizing it was great. The comment about the horse escaping a forward trot by cantering really hit home for me! I agree. It’s so easy to get caught up in the neck because it’s easier to see it than feel it! Great summary so far! I will definitely be taking these concepts with me in my rides this week. Bummer that Debbie wasn’t able to teach, but Chris is pretty great too! Thanks! Though I had heard of Hilltop Farm I wasn’t so familiar with Chris, but he ended up being a great clinician who really made improvements with each pair he worked with. Thanks for the summary! My brain would be mush after such a long day. Seriously- my brain was leaking out of my ears at the end of it all. Cue the caffeine! That and the ‘lengthening available at any time during trot’ really resonated with me. A feeling I will be aiming for, for sure! My horse certainly prefers tracking right! Great notes. Mine too for sure- I hadn’t heard it ever put that way, so it was an interesting observation! This is an awesome summary! Definitely one for the bookmarks. I like that big bay checking out the crowd! That big bay was hands down one of the nicest horses there. Green, but put together like Valegro. Gorgeous. This sounds like an amazing clinic! I am so jealous!! There is so much to get out of just auditing sometimes! Great notes! Definitely some stuff I can use! Super info from the clinic – thank you! Would love to attend a clinic like this. Those are some gorgeous horses. Also loved your summary. I get all fried out, and usually don’t remember anything to recap on. Great job!